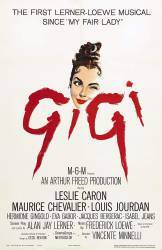 Visible crew/equipment: When Isabel Jeans is telephoned by Madame Alvarez and told that Gigi has refused Gaston's advances, she gets out of bed and walks across the bedroom. As she passes a cheval (full length) mirror a pair of retreating jean-clad legs and a hand feeding out cable can be seen in the reflection. Continuity mistake: When Gaston is not allowed to take Gigi out for tea, Madame Alvarez tells him to sit down. As he is seating himself, he unbuttons his jacket. A moment later, he stands up and unbuttons his jacket again. Honore Lachaille: Youth is the thing, Gaston. Youth. Stay close to the young and a little rubs off.